Proving ROI for content marketing is difficult for even the most seasoned of marketers. The numbers bear this out as 79% of content marketers confess to being unsuccessful at proving ROI. Unfortunately, unless you can connect your efforts to dollars earned or saved, you have no proof of your marketing plan’s effectiveness. Compounding the issue is the vast amount of content that lives on a wide range of platforms. It seems impossible to know how somebody gets from Point A to Point B when they have 50 paths to choose from. So, how do you measure the unmeasurable? You start with Dave. He is one of the 21% that have figured out how to measure and then apply learnings from content ROI. 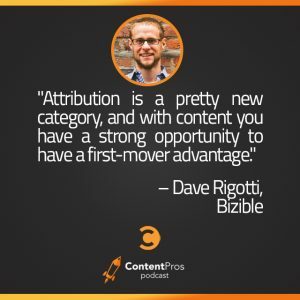 At Bizible, they are all about making every marketing dollar profitable and their success can be seen in the four full-time content writers that are funded through their content marketing efforts. His ahead-of-the-curve approach to content ROI will help you measure your marketing plan’s effectiveness and grow your B2B brand organically through content. An entrepreneur from the very beginning, Dave spent his childhood mowing his neighbor’s lawns in small-town Ohio and dreaming of one day running his own landscaping business. He didn’t end up becoming that small business owner, but that’s alright because he loves the turn his career took to working in technology.